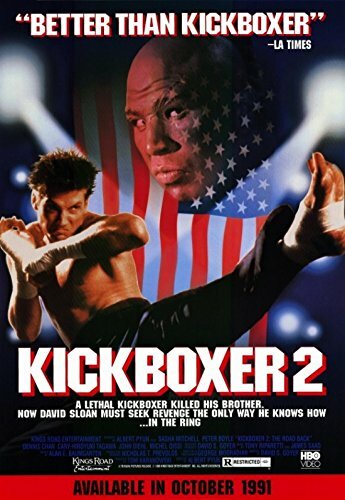 Review: Billed as a sequel to Kickboxer, starring Jean-Claude Van Damme, David Sloan (changed from Sloane in the original) (Sasha Mitchell) runs a kickboxing gym in Los Angeles. Since the events of the original film, Kurt and Eric Sloan have been killed by the ruthless Tong Po (Michel Qissi), and all hope for vindicating the Thai kickboxing community looks lost. However Tong Po's manager Sanga (Cary-Hiroyuki Tagawa), learns of David's existence, and sets up a match between the two foes. Reluctant at first, David begins training under his brother's master Xian Chow (Dennis Chan), to avenge his brothers' deaths once and for all. I loved the original Kickboxer film, but this one seemed disjointed from the get-go. I had a hard time resonating with the notion that Jean-Claude Van Damme, Dennis Alexio, and Rochelle Ashana's characters were all killed off-screen since the end of the original film. Tong Po poses as vicious a villain as ever, and the awesome Xian Chow is back to his silly training antics, but this movie severely lacked the punch that those three integral characters provided. It felt like a Kickboxer movie, but I was longing for many of the elements that made the original great, and I had a hard time connecting David Sloan to his brothers being that we never got to see them on screen together. This movie wasn't all bad. Despite my criticisms, I don't think Sasha Mitchell did a bad job playing David Sloan. Mitchell is an accomplished martial artist in his own right, and his final fight scene with Tong Po is both brutal and entertaining. Kickboxer 2: The Road Back certainly has some entertainment value on its own, but if you're looking for a true sequel to Kickboxer, you'll assuredly be left disappointed. Fun Fact: Jean-Claude Van Damme turned down this movie to do Double Impact (1991) instead.